Fifteen years ago, Aubrey de Grey organized the first SENS roundtable–Strategies for Engineering Negligble Senescence. It was a small group of out-of-the-box thinkers, heretics who talked about attacking head-on the idea that aging is just part of the human condition, looking for medical (and beyond-medical) treatments that would restore strength, stamina, and alertness, and lower the risk of all the diseases of old age at once. There followed five more SENS conferences in Cambridge, UK. Now, SENS HQ has moved to Silicon Valley the series has been absorbed as a summer Rejuvenation Biotech conference in California. This is the mainstreaming of anti-aging science, the product of many long years of work and relationship-building, largely by Aubrey himself. As Joni Mitchell wisely warns, “Something’s lost and something’s gained…our dreams have lost their grandeur coming true.” There is a lot more money, a lot more data, well-established people and funders are involved. But there is less daring, out-of-the-box risk-taking than in the past, and my personal judgment is that we are still at a stage of understanding where high-risk science is essential. At one point, a young man posed a question in a session devoted to cancer strategies. The most common cancers attract the most funding, he said, and there has been little progress over the years in survival percentages in these cases. Meanwhile, there has been dramatic progress in rare cancers, though they are the province of fringe research with little mainstream funding. Perhaps there is an inverse correlation between funding and scientific progress. Perhaps funding distortions favor repeat funding of long-term projects, with a resulting bias toward failed ideas. Perhaps funding makes scientists more conservative, and impedes discovery. This was a perspective that no one could digest, and audience and speaker moved on with embarrassed laughter. At the end of this page is the most exciting thing I learned at the conference, which is also the most far-flung and likely to be an artifact. Tony Wyss-Coray of Stanford has what I consider the boldest and most promising program for rejuvenation today. He discovered last year that mice given 8 infusions of 0.1 ml blood plasma from a young mouse showed dramatic improvements in cognitive performance. (This is the equivalent of about ½ pint of blood per infusion in human scale.) Tony told us that there was an unpublished experiment in which similar benefits were achieved with blood from young humans infused into older mice. The cognitive improvements last at least a few weeks, but were not tested beyond that time frame. Take a moment to appreciate how unexpected this was. Even for those of us who are enthusiastic about the ability of blood factors to reprogram the body’s age, we expected that many repeated treatments would be needed, and that it would be necessary to remove pro-inflammatory factors from old blood as well as adding pro-growth factors from young blood. Most blood factors are constantly being generated and destroyed, so their lifetime in the bloodstream is only a few hours or even minutes. It was beyond optimistic to think that so short a course of treatment would have a measurable effect. Georg Hollander presented a cogent and enlightening exegesis of the thymus, from basic function to ongoing projects. The thymus is a small gland under the breastbone that is responsible for a crucial function of the immune system: traing white blood cells (T-cells) to distinguish between self and other, so they can consistently attack the latter and spare the former. In adulthood, the thymus atrophies (“thymic involution”), and in old age there is almost no thymus left, with the disastrous result that T-cells not only fail to protect our bodies from invaders, but treat our bodies as the enemy, leading to autoimmunity. The training is performed by web-like epithelial cells, shaped like crumpled blankets, each epithelial cell in contact with up to 60 developing T-cells. Epithelial cells must express every single protein in the genome, and there is a transcription factor called AIRE that binds to DNA, promoting “promiscuous expression.” Curiously, AIRE works best for genes that are normally turned off by methylation or acetylation. 15% of genes are expressed only in the presence of AIRE. There are micro-RNAs that are also necessary for promiscuous expression of all genes. Hollander has been working on the hypothesis that each epithelial cell succeeds in programming only a random subset of the genome, so if you have fewer epithelial cells late in life, the cells collectively will not express every single gene in the body; there will be holes in the set of all genes represented in the thymus, and as a result there will be autoimmunity. He said we need a minimum 200-300 epithelial cells for a fully-functioning thymus that protects the body against itself. At Wake Forest Inst, John Jackson is working on growing epithelial cells in a petri dish, then forming them on a scaffold, integrating blood vessels (vascularization) and structural (stromal) cells. His intern Blake Johnson made remarkable progress in a single summer toward creating a functional mouse thymus. Mice (like other small animals) have much larger thymi in relation to body size; and (like humans), they lose most of their thymic volume over their short lifetimes, with the result that their immune systems are disabled and they are vulnerable especially to cancer. Very broadly, there are two approaches to anti-aging medicine, which might be called “bioengineering” and “endocrinology”. The question is, how much of the change that takes place with age can the body reverse with its internal resources, given the appropriate chemical signals (that’s endocrinology)? And how much remains that must be rebuilt or replaced with prosthetics (bioengineering)? From the beginning, SENS has emphasized the bioengineering approach–its middle name is “engineering”. I am more optimistic about what the body might be able to do on its own, if only we can master its biochemical language. Significant advances have been made in bioengineering in the 15 year history of SENS. A prosthetic limb no longer needs to be a peg leg, but can be designed to respond to neural signals. Prosthetic eyes and ears have come down from the clouds into the realm of the feasible. The first organs grown cell-by-cell on scaffolds in the lab have been re-implanted successfully in human patients. But even more stunning and promising breakthroughs have appeared in the realm of chemical signaling. In 2000, before the Bush Ban, all stem cell research depended on embryonic stem cells harvested from foetal tissue; but turning muscle or skin cells back into stem cells has turned out to be surprisingly easy (though the process is still being refined). “Epigenetics” was an abstract noun in 2000, and it is now the fastest-growing area of biological science. Epigenetic signaling may be the organizing principle of whole-body aging [ref, ref, ref]. Signal proteins have been identified that turn on whole systems of genes that retard aging. Better yet, pathways that promote inflammation (e.g. TGF-β, NFkB) can be blocked, while some blood factors (e.g. FOXn1, oxytocin) turn on regenerative pathways, with the promise of rejuvenation. Steve Horvath has pioneered a bioinformatic approach to identifying the epigenetic differences between old and young humans. Business is averse to risk. Science is all about exploring the unknown. It’s not exactly a match made in heaven. Chas Bountra is deeply tied to the establishment, but radical in his own way. He is a veteran of many years as head of research at Glaxo Smithkline, and now directs the Structural Genomics Unit at Oxford. His focus is Alzheimer’s Disease, and tells us why: We have a basic understanding of cancer, stroke and heart disease, and are making steady, incremental progress toward prevention and higher survival rates. If current trends continue, dementia will be the scourge of the next generation, exacting an unaffordable social cost as patients survive for years, unable to contribute to society, to care for themselves or even to enjoy social interactions with others. For a commie like me, this model is tainted with corporate welfare, but while I choke on the social injustice, I admit that it is practical and effective in today’s political environment. That title probably goes to George Martin, at 88 still deeply thoughtful and open to new ideas in his U Washington lab. I visited George a week earlier, on my way to San Francisco. Len Hayflick, 87, works at UCSF. At 86, Bruce Ames is still active and doing good work. After the conference, I was privileged to visit his lab in Children’s Hospital Oakland Research Institute (CHORI). Ames has been doing innovative biochemistry since the 1960s, and by now has persevered to see some of his heresies absorbed into the canon of public health. After a 32-year career at UC Berkeley, he moved to emeritus status and opened his present lab in 2000. In 1972, Ames launched his career by investing a quick and easy lab test for mutaogenicity (and presumptive carcinogenicity) that has saved millions of dollars and countless rabbits and mice. In the 1980s, Ames was an early influence on my diet and helped form my understanding of aging. In that era, we all thought about buildup of toxins and cumulative effect of carcinogens. Ames was at the forefront, ranking carcinogens by a scheme he called HERP, which took proper account of potency and average public exposure. The conclusion that surprised him and alienated many advocates of natural medicine was that natural carcinogens are common in the foods we eat, overwhelming the risk from pesticides and preservatives for which we were seeking tighter regulation. Always an evolutionary thinker, Ames headed off the argument that we might be evolved to deal with natural carcinogens but not manufactured carcinogens, demonstrating that diets and lifespans of our hominid forbears made that conclusion unsupportable. Ames was one of an elite group at the first SENS roundtable discussion in 2000, forerunner of the RB2015 conference that I attended last week. Today, Ames argues that dozens of micronutrients are essential for both day-to-day metabolism and for long-term health. When any of these micronutrients are in short supply, the body prioritizes the former, and the latter is shortchanged, with consequences for longevity. In Bruce’s lab, I met Rhonda Patrick, a dynamic young post-doc who both does innovative nutritional science and has a uniquely nerdy and well-informed video blog, FoundMyFitness.com of health advice, broadcasting biochemistry, nutrition and metabolism for the masses. I can’t resist noting how pleased I was to find support in Bruce’s lab for my contrarian idea that aging is controlled in part by an evolved genetic program. I have been an advocate of metformin for everyone, and enthusiastic about Nir Barzilai’s trial of metformin as an anti-aging drug. Last week, I learned from Brian Hanley that metformin has a dark side, to wit, a statistical association with higher frequency of Alzheimer’s disease [ref, ref]. There is a biochemical mechanism that makes the epidemiology more compelling. B12 supplementation may mitigate the risk. Other studies [ref, ref] have found that diabetes patients have elevated risk of dementia, and that that risk is reduced when they take metformin. So it’s fair to say that there is contradictory evidence, and the direction of the effect may depend on individual variation. Here is a balanced view of both sides. A reader of this blog, George Goldsmith has written to me that berberine is a good herbal substitute for metformin. Everything we know about berberine looks really good–it is an anti-inflammatory as well as helping preserve insulin sensitivity, acting through the AMPK pathway. But we have much more experience with metformin, both clinically and in the lab. Metformin increases life span in mice, and to my knowledge, this test has yet to be performed with berberine. Magnesium supplements also can help prevent insulin resistance, and there are other good reasons to take magnesium. Gynostemma pentaphyllum, sold by LEF under the brand name AMPK Activator, is another herbal alternative to metformin. Bill Andrews was a major sponsor of the conference and a ubiquitous presence, though he did not make a presentation. Curiously enough, the only spokesperson for telomere biology was Judith Campisi. While Andrews has taken the position that lengthening telomeres is more than a good thing, possibly a key to reversing aging, Campisi has cautioned us that telomerase is rationed by the body, and there must be a good reason for this. For two decades, Campisi has been the principal advocate of the thesis that telomeres are permitted to shorten in order to protect us from runaway replication of tumor cells. My judgment is that Andrews has it right, and Campisi is clinging to a flawed theory At this point, overwhelming evidence tells us that short telomeres cause many more cancers than they prevent. To her credit, Campisi has backed away from the cancer theory which she had so long propounded. But she has yet to embrace the radical truth that telomere shortening is an evolved mechanism of programmed death (and has been since the dawn of eukaryotic life). Campisi is a good scientist who knows as much about telomere biology as anyone on the planet; but she has afforded too much deference to the prevailing evolutionary perspective, though it is contradicted by evidence that she can (and does) recite from memory. So her more recent papers stress the (sometimes) beneficial role of inflammatory signals in promoting wound healing, and she pursues a theory that she hopes will someday explain the devastating consequences of telomere shortening as a necessary price to pay for the signals that call forth repair and renewal. Meanwhile, flawed evolutionary theory continues to be the principal obstruction that impedes progress toward an effective telomerase activator which, I believe, will add years to our lives. Neither VC investors nor NIH funders have given this subject the priority it deserves. Wuyi Kong is a researcher in regenerative medicine who spent 15 years at Stanford before returning to her native China five years ago. She now has a private for-profit business, incorporated in Silicon Valley and relocated to China, with enough funding from the Chinese government to get tantalizing results, but not enough to do clinical trials. She describes particles in umbilical blood that confound a basic principle of biology: that every cell comes from another cell. She calls these medium-size particles NPRCP, for non-plasma RNA-containing particles, and has observed them in electron micrographs, as they agglomerate into stem cells. 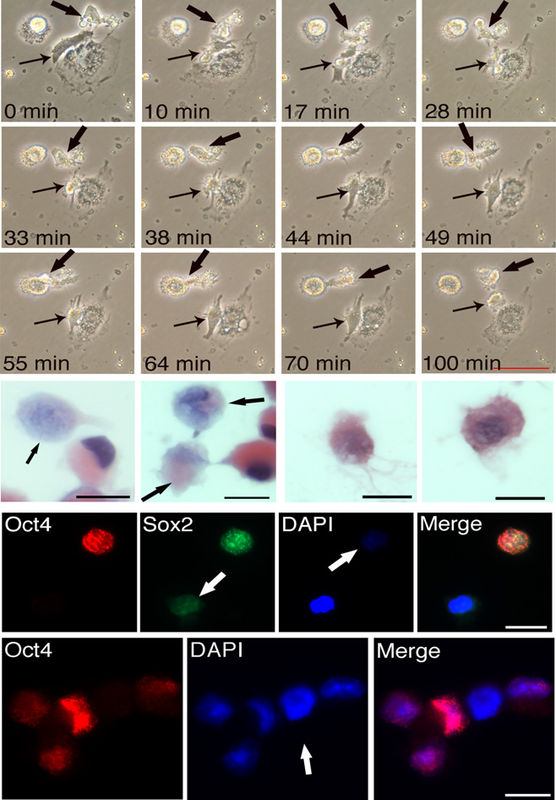 Time sequence shows particles aggregating into cells. This is either a Nobel Prize or an anomaly. For 15 years, Kong has been filtering these particles from umbilical blood and injecting them intravenously, first into mice and then into humans, with spectacular results. In her most complete and convincing paper, she damages the kidneys of mice by cutting off blood supply, then demonstrates regrowth of the kidneys after infusion with NPRCPs. The problematic claim is that NPRCPs are non-living particles, yet they agglomerate to form stem cells, which are then ennucleated with DNA from the recipient mouse. This is indeed strange science, but isn’t this all the more reason to replicate her experiments? Kong claims anecdotal evidence for erasing wrinkles and white hair turned to black. More substantively, she says patients have improved energy and faster healing. One semi-comatose patient with advanced AD recovered not just her consciousness but also her short-term memory. This is the kind of speculative, creative science that I have come to expect at SENS conferences. Most such reports do not pan out, but some of them lead to spectacularly disruptive technologies. We can survive with no less. Yes you are right about Telomerase therapy and it has been consistently shown that it is not a cancer prevention mechanism nor does induction of telomerase increase cancer, in fact many studies suggest the opposite due to the increased stability restored telomeres bring. I think the only way to silence the last of the people standing by old ideas long since dismissed is simply test it. Telomeres are certainly not the only problem we must fix but they are a big piece of the puzzle as Dr Fossel suggests, we can expect induction of telomerase to mobilize stem cells, repair a lot of damage and restore a good gene expression profile. In the Wyss Coray experiment you say “mice given a single infusion of plasma from a young human” was this supposed to be from a young mouse? Do you really mean mice got plasma from a human? Thank you, Sabra. I think I mis-heard the lecture, and with your prompting I have gone back to read the 2014 paper, and I have made the correction above. It was indeed mouse blood, and there were 8 infusions over 3 weeks, not a “single infusion”. If you listen to the TED talk, he does actually mean that young human plasma is injected into old mice and causes a rejuvenating effect in the mice. He said that this was to test whether human plasma has the same effect as young mouse plasma. They also tried injecting old mice with old human plasma, but the mice were not rejuvenated. This can be found at about 9:40 of the audio-only TED talk. Did they have a control group that received non-young blood? Sorry, I messed things up. I was thinking about parabiosis experiments, I don’t know why. I meant saline infusion. Pain relief is very prone to placebo effect. Why not have the clinical trial if is good as Kong writes. One of the Wyss-Coray lab’s researchers did administer human plasma/growth factors to mice and did see similar rejuvenation effects. Nothing published on that as yet. An August issue of Current Aging Science is focused on the theme, Is Aging a Failure or a Conquest of Natural Selection? It contains several interesting articles, including one by Dr. Aubrey de Grey entitled, Do We Have Genes that Exist to Hasten Aging? New Data, New Arguments, But the Answer is Still No. It also contains an important literature summary article by Dr. Harold Katcher entitled, Towards an Evidence-based Model of Aging. All the articles referenced are available as PDFs. Abstract… The modern synthesis or evolutionary theory of aging assumes that aging results from the accumulation of errors or damages at the cellular level through the inadequacies of an organism’s repair and maintenance machinery. The demonstration of cellular and organic rejuvenation requires the hypothesis that aging is the result of irreparable damage to be rejected. I will propose basic principles of mammalian aging based only on experimental data, without imposing the constraints of evolutionary theory. Consideration of the results of experiment suggests that fundamental assumptions about cell and organ aging being autonomous process, and about the centrality of cellular aging in organismic aging are wrong. The derived principles indicate that exogenous control of age-phenotype at cellular and higher levels of biological organization is possible. I’m interested at first to discuss the eleven Principles of Aging as Determined by Experimental Studies that Katcher sketches and provides evidence for. I believe some of these have practical implications and it would be useful to discuss them in detail. I prefer that the discussion focus on evidence for and against these principles and whether additional principles can be identified. I prefer that the discussion not become a debate about the larger question of Programmed Aging vs. Non-Programmed Aging. I think a forum thread focused on Dr. de Grey’s article is more appropriate for that debate. Harold is a colleague and an ally, from whom I have learned a great deal. I agree with almost all of what he is saying.